Twitter came under fire for its lack of credibility as a real-time news source during the bombings in Boston earlier this year, thanks to a variety of hoaxes and erroneous reports that were spread about those who were allegedly responsible for the attacks. But despite these obvious flaws, researchers with the Harvard Medical School who looked at information flow on Twitter during the bombings argue that the network could be a valuable tool for emergency workers and others during such disasters. The research was published earlier this week by PLOS One Currents, an open-access journal that is part of the Public Library of Science, and was based on the work of several scientists who are affiliated with the Harvard Medical School, as well as one researcher from the Brigham and Women’s Hospital in Boston, MA. 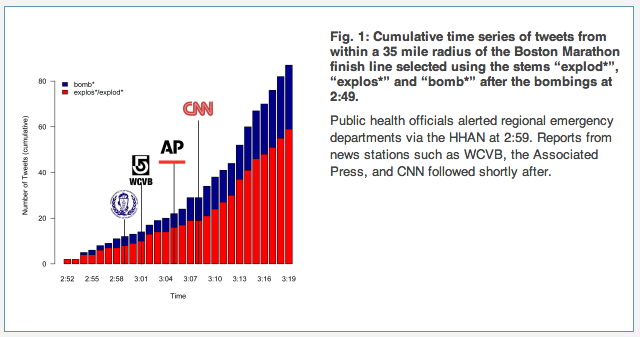 Entitled “Twitter as a Sentinel in Emergency Situations: Lessons from the Boston Marathon Explosions,” the study used the public Twitter API and looked at a set of messages whose geolocation data showed that they were posted within a radius of about 35 miles from the Boston Marathon finish line. The researchers looked for messages that contained words beginning with ‘explos’ or ‘explod,’ as well as ‘bomb,’ and found that some were posted within minutes of the explosions, well before any official sources. Because the use of these terms was grouped so tightly together around the site of the bombings, and occurred so quickly after the explosions, the researchers argue in their paper that using these kinds of tools to track certain terms could help emergency workers discover where people need their help — and help police and others track down what exactly happened and when. A number of other studies have come to similar conclusions: after the earthquake in Haiti in 2010, for example, one of the researchers involved in the Boston study — Dr. Rumi Chunara, a research fellow at Harvard — looked at how quickly reports of cholera spread via Twitter, and found that they were able to pinpoint outbreaks two weeks before official sources. Your last post [Research shows Twitter could be a tool for aid workers during events like the Boston bombings] was freaking awesome. I have gone ahead and added your stuff to my Feedly account. Please keep me updated if you post anywhere else. I got all the news on #Boston from Twitter and don’t recall anything being false. I have seen many instances of the same #oldmedia that points out social media errors getting stories very wrong. Seems obvious that people in the vicinity are going to do a better job than people speculating from a studio and the crowd has to know more than any one reporter setting up for a good shot.